1 Independence has only been partially recognised internationally. 2 The census is a reconstruction; most of the ethnic Albanian majority boycotted. 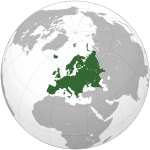 3 Adopted unilaterally; Kosovo is not a formal member of the Eurozone. 4 Officially +381; some mobile phone providers use +377 (Monaco) or +386 (Slovenia) instead. Kósófò (Àdàkọ:Lang-sq; Àdàkọ:Lang-sr) je agbegbe onijasi ni Balkani. Orile-ede Olominira ile Kosofo (Àdàkọ:Lang-sq; Àdàkọ:Lang-sr), orile-ede alominira to fi ra re lole, to si je didamo bi orile-ede lowo awon die de facto lon sedari agbegbe ohun, pelu ijanu die ni Ariwa Kosofo.. Serbia does not recognise the unilateral secession of Kosovo o si gbabe bi ibi ti Aparapo awon Orile-ede undari ninu agbegbe ilaselorile. ↑ See  Àdàkọ:Sh icon UN estimate, Kosovo’s population estimates range from 1.9 to 2.4 million. The last two population census conducted in 1981 and 1991 estimated Kosovo’s population at 1.6 and 1.9 million respectively, but the 1991 census probably under-counted Albanians. The latest estimate in 2001 by OSCE puts the number at 2.4 Million. The World Factbook gives an estimate of 2,126,708 for the year 2007 (see Àdàkọ:CIA World Factbook link). ↑ "Kosovo". International Monetary Fund. Retrieved 2010-04-21. Àtunṣe ojúewé yi gbẹ̀yìn wáyé ni ọjọ́ 17 Oṣù Kínní 2019, ni ago 16:46.